If we had to say we specialised in anything it would be Dining room furniture. With three comfortable chair designs as standard and a wide range of tables we can provide a solution to most people’s requirements for dining sets. Most of our designs lend themselves to quite a large size range, which we don’t restrict to 6” or 12” increments. Dimensions can be altered to best fit your available space. This is our flagship set for elegant dining, comprising of our double pedestal table and No 64 chairs with leather seat pads. 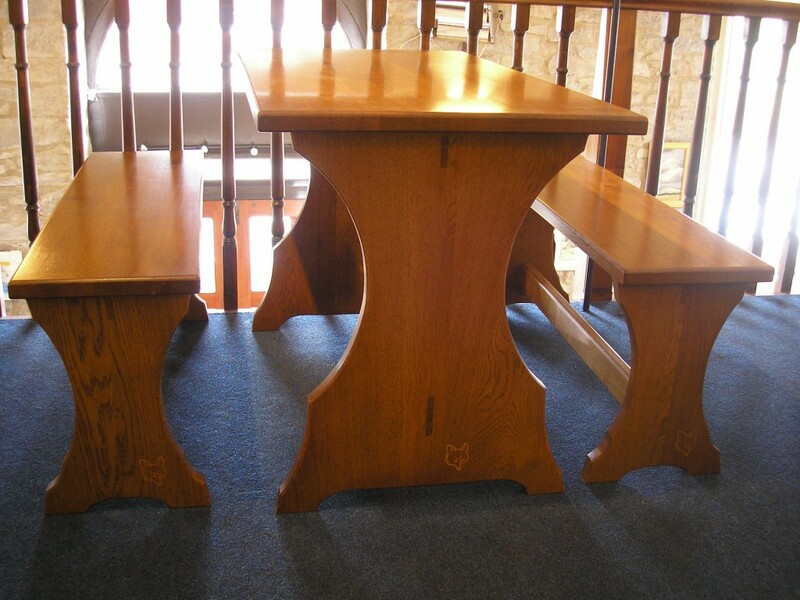 The table shown is 6′ x 3′6” with 4 chairs and 2 carvers, all with drop-in leather seat pads, priced £4,180. Our smallest example of this table so far was 5′ x 2′6”. The largest was a 9′ x 5′ oval! 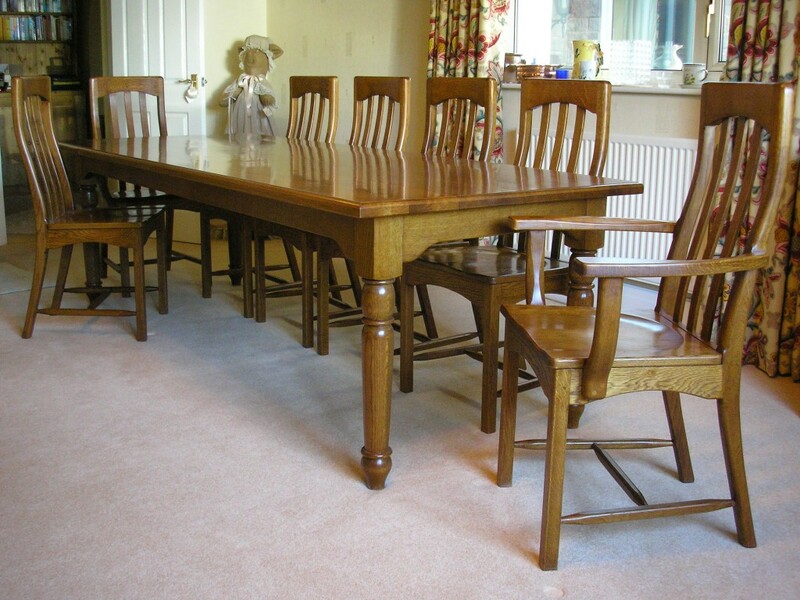 This is our Cottage table with wooden seated No 64 chairs and carvers. The table shown is 8′ x 3′ x 30”. 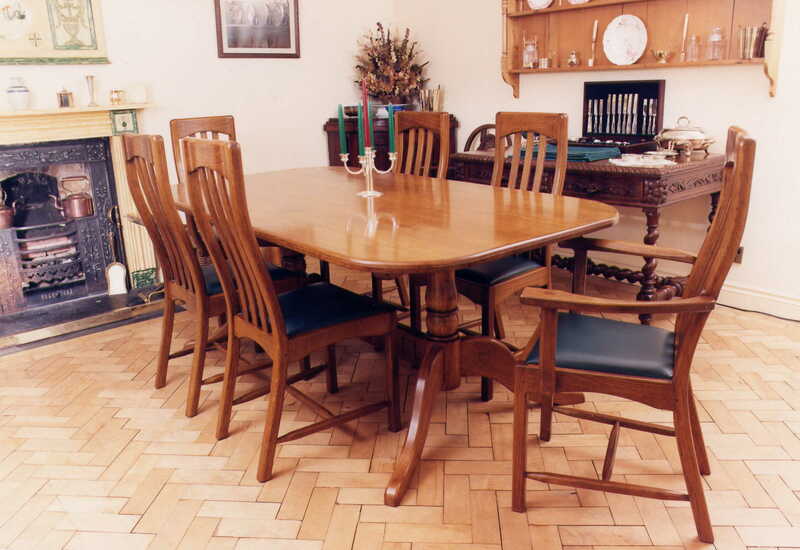 Set price for 8 chairs, 2 carvers and table £5,380. 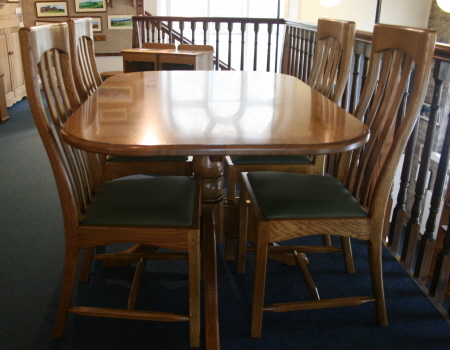 This actual dining set is available now in our showroom, pre-loved, in beautiful condition, priced £3,200. Call us at the workshop on 01298 84467 if you are interested. There will never be another chance like this. This is our latest addition to the range, our Refectory breakfast set which is intended as a compact but sturdy option when space is limited. Access is made easy by the design of the leg and is made to withstand the rigours of daily use. 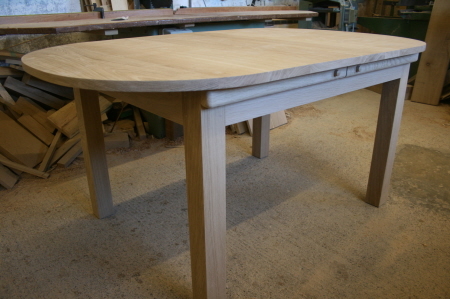 Table 44” x 24” x 29” and the set is priced at £999. 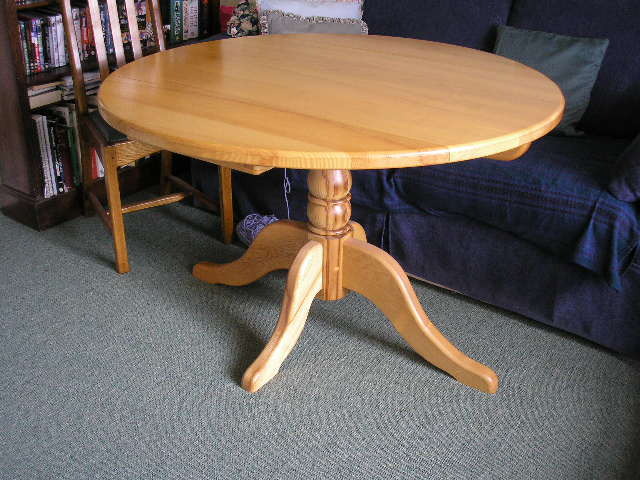 This is our popular drop-leaf pedestal dining table, which is a very practical solution to the eternal space problem. The simple, effective sliding leaf support is easy to operate and doesn’t cause any obstruction under the table like a hinged leg would. When both leaves are down, the centre section at 24” is a comfortable place setting for 1 person. 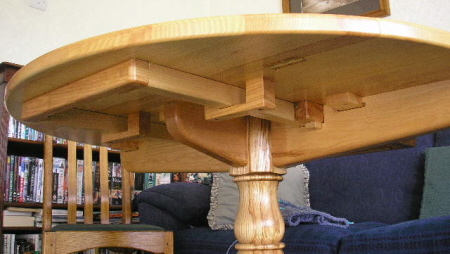 With the leaves lifted to form a 45” round top 6 people can easily be seated. 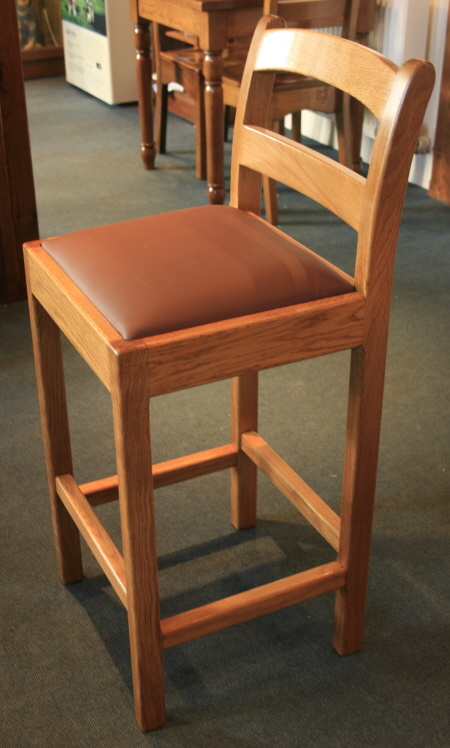 We can offer this style in any size from 42” to 60” and it blends well with all of our chair designs. The size shown is priced at £1450. 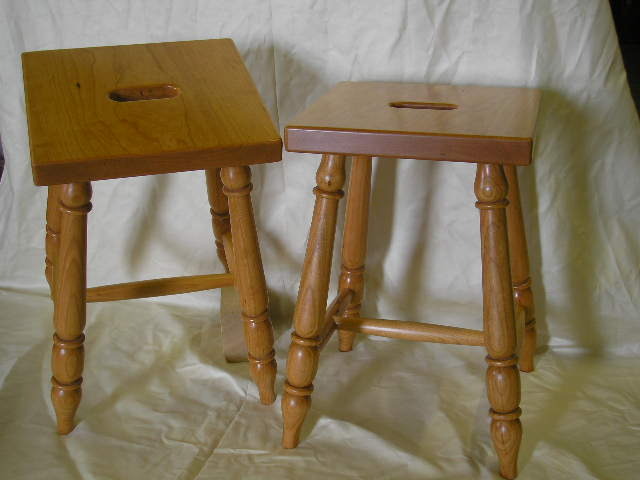 Our Coffee shop tables are very practical for kitchen spaces and can be made to fit your space. The chairs shown are designed to be compact and easy to clean around with a deeper seat rail and no H frame. 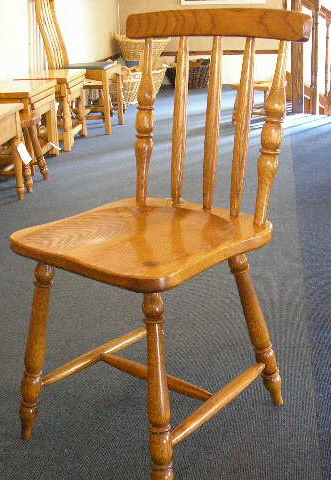 This chair can also be offered with a leather drop in seat pad. 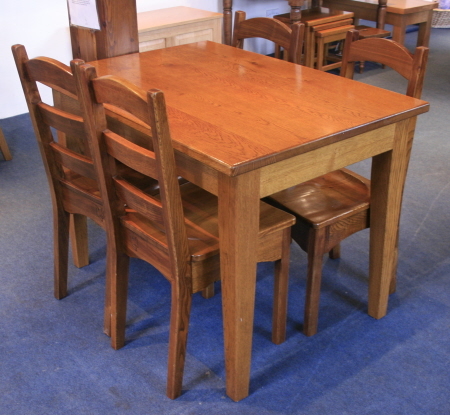 The table shown is 48” x 30” x 30” , guide price with the 4 chairs is £1675. A single pedestal rectangular table is another neat, practical solution for a limited space. Shown at 52” x 36” it neatly fits 4 chairs under and can easily accommodate 6 diners. Shown here in light Ash, guide price £2,800. This one is currently available in the showroom. 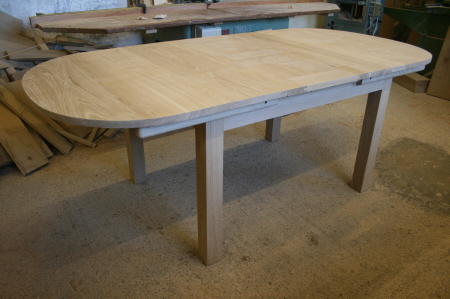 One of our many extending table options is this sliding leaf version. The two halves slide apart and the leaf, stored in the base, is dropped in to the gap. This one is 6′ x 3′ when closed and 8′ x 3′ with the leaf in place. Guide price is £1850. 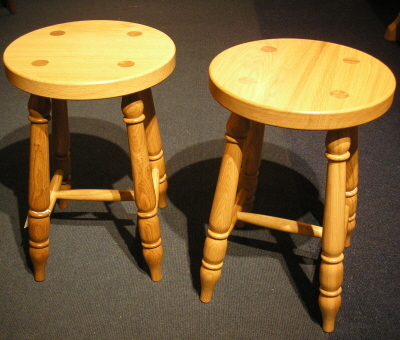 Light oak dining stools £165 each. There are many options for tailoring seating to match your room, so please give us a call if you would like to discuss a possible order. You will be speaking to the people who will make it, so there are no third party costs or restrictions!